A lot of the houses in SCoD that did not sell prior to the MIR deadline seem to just be sitting on MyHome and Daft since the new year. Most are asking 550K+, and to me it seems there is a limited target audience in that price range. It could be that we are still early into the new selling season and that some of these will eventually be sold. However I cannot see the majority of them selling at the current asking prices. Also, it seems to me that with the new insolvency bill there is going to be a tussle between the govt and the banks. The govt is going to look for some parking of the debt while the banks will want to sell off non-performing loans. If the banks have their way we could see more properties come to the market (not necessarily in SCoD though). However this could put downward pressure on asking prices in general. So what do you guys think? Is this just wishful thinking or are we going to see some movement in the near future. Seeing a number of new “For Sale” signs around the D6 area in recent weeks. Nothing scientific but just an observation. Would be good to have daftwatch to verify the same however it seems to be down. Anyone out there keeping an eye on the supply? Approx 1000 new properties coming onto the market each month. Listening to snoozetalk this morning oh so briefly caught this story. To paraphrase Ulsterbank analyst, "well all things have to end so it looks like it’s bottoming out… "
What I take from these numbers is there is a functioning economy that can sustain itself and will not until the source of paralysis creating asphyxiation is reformed. Prime Time in 30 mins…Personal Insolvency details to be discussed. To quote the great Lily Tomlin, no matter how cynical you get, it’s impossible to keep up. A great illustration of both where we are, & how we got there !! My rant on the construction lobby letting us know that they were in the 7th year of decline was just to remind them that in most ways they were absolutely the authors of their own destruction. They built too much, & borrowed too much, & then when they couldn’t borrow any more, they got others to borrow 10x their salaries to buy a house that might never be built off plans. As some woman said about 2007, ‘Ireland is built !’. I accept that not everyone in construction was reckless, but most were, & a lot of the survivors were companies & individuals who’d seen it before, & survived because they weren’t as greedy as the rest. The best chance of breathing some life into the construction sector would be to shitcan idiotic planning rules like ‘local needs’ & reduce the cost of getting planning permission. This would make self-builds & one-off builds considerably cheaper, because it would force down land costs. Of course this would also make all the housing stock in NAMA totally unsaleable, so it’s unlikely to ever happen. Distant relatives are sellng their family home following the death of their last parent. Nice enough 3 bed on the Northside of Cork. Asking around €130k its already reached that only been on the market about 8 days. There are SIX viewings arranged for next week.Other houses in the area sold for around €100k recently and though this house is in better condition I am surprised. Market 1, where houses are free to be bought and sold. This is a very tight market involving a small number of properties. Almost by definition, the majority cannot be properties with mortgages older than about 10 years. Nothing much built after some time in the 00’s. In this market, prices, rents and demand are strong. Market 2, where properties are not free to be bought and sold. This market is hermetically sealed in a plastic bag and stored away on a high self where those in market 1 cannot reach it. Within the bag, all sorts of stuff is going on - restructuring, banks and customers “talking”, debt forgiveness, strategic defaulting, OO’s and BTL’s both, voluntary surrenders, who knows what else - but the bag itself operates in a separate universe (that high shelf) to market 1. In this market, concepts such as price, repayments and free market are relative. And ne’er the twain shall meet. Yep, there are still life forms on planet Bertie. Not intelligent mind you. If you got this through the door, would you feel happy to be reminded of an appreciating asset? 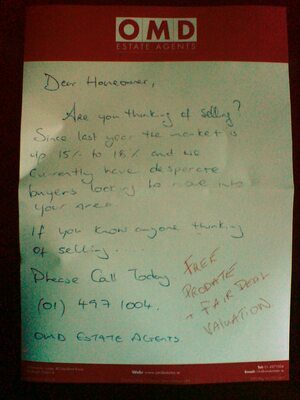 Smacks of desperate Estate Agent more than desperate purchasers. Are you the owner of this property and thinking of departing this world soon or perhaps you’re the greedy relative of the owner, why not call us now for a free valuation?